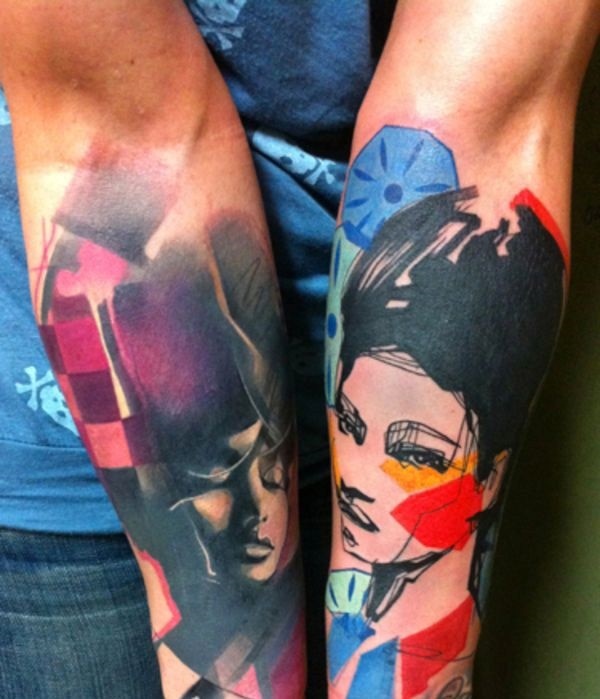 Being inspired with the contemporary art in a tattoo version is the new trend in this X generation. 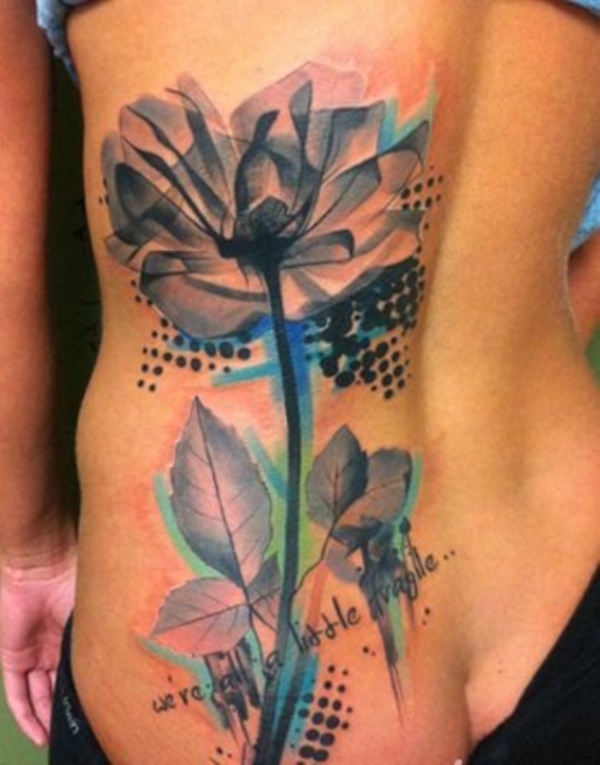 Usually, we often encounter people having black tattoos that represent a quote or an image. 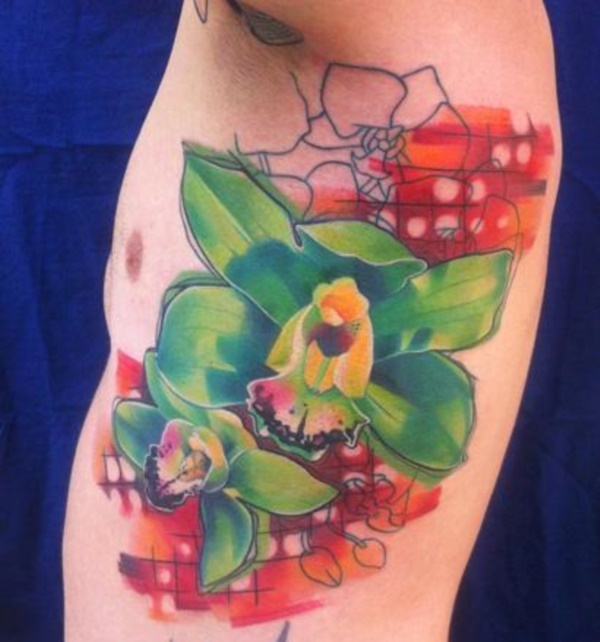 This time, the artistry of tattoo extend up to the application of colors. 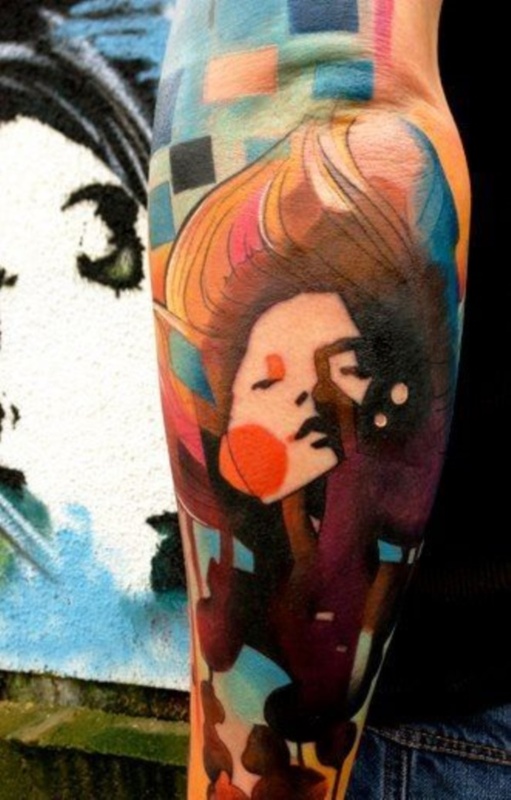 The modern tattoos nowadays are infused with different vibrant colors in which they often referred this as an Ivana Tattoo Art. 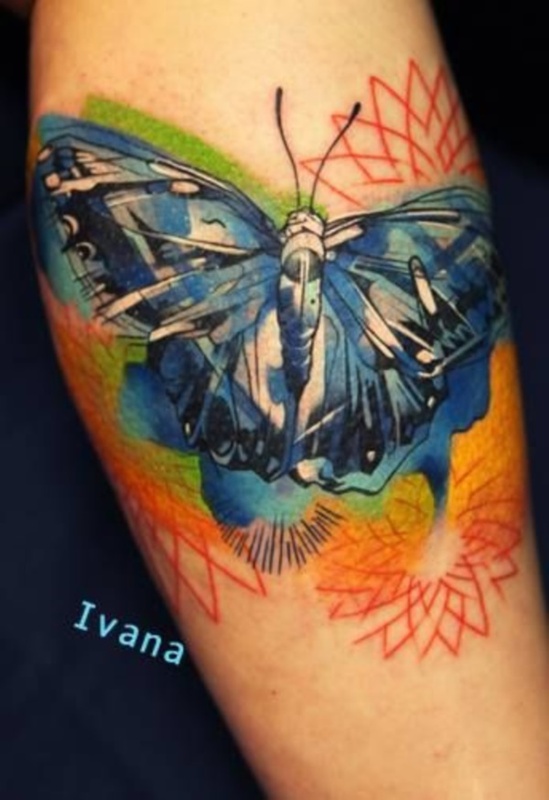 Apart from the effect of the colors, Ivana Tattoo Art have animated illustrations and makes the tattoo technical and remarkable. Try to have an Ivana Tattoo Art so you would appreaciate its essence. 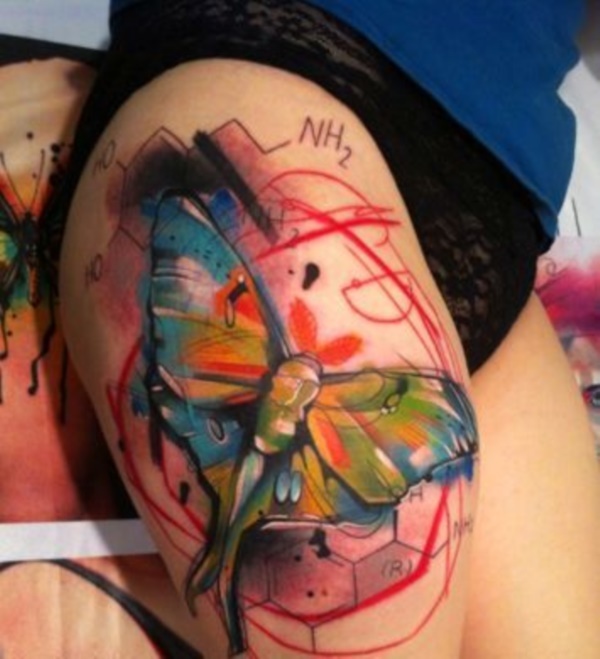 The image is mysterious and scientific inspired tattoo. 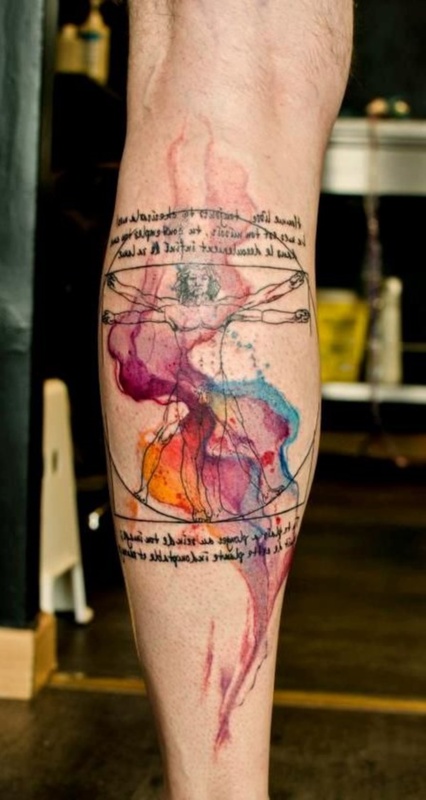 This body art is not only a black classical tattoo but enhance with abstract colors. 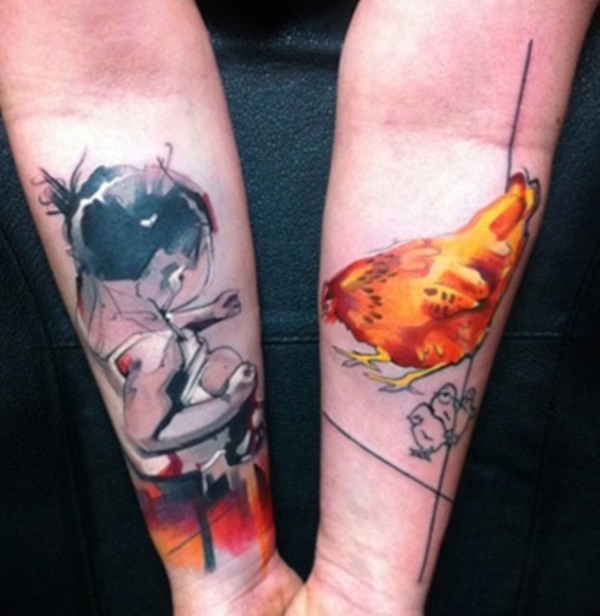 The lively and vivid tattoo is like a 2D inspired art. The effects of the petals looks like real and it resembles the original rose. 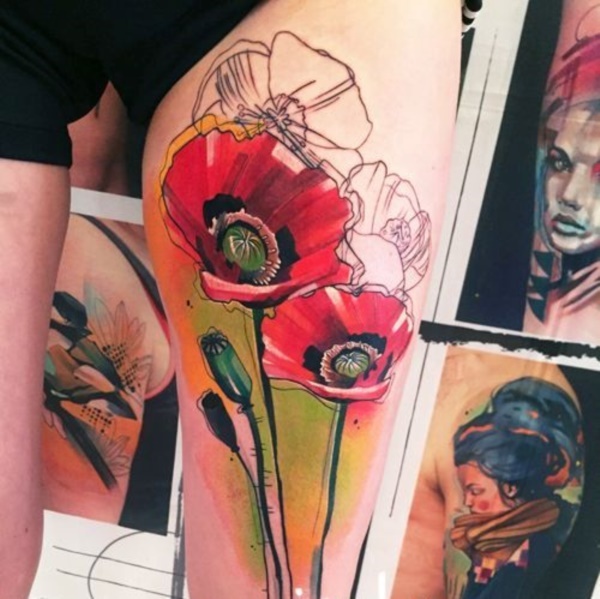 A stylish floral body art. 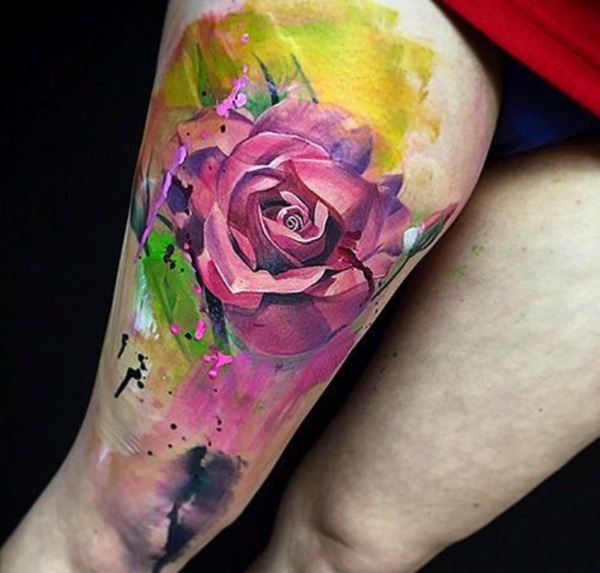 Amazing, that’s the very definition of this floral tattoo. It really resembles a paint-like art and the colors used properly blend with each other. Some people love insects. In fact, some collect these insects and put them in a terrarium. 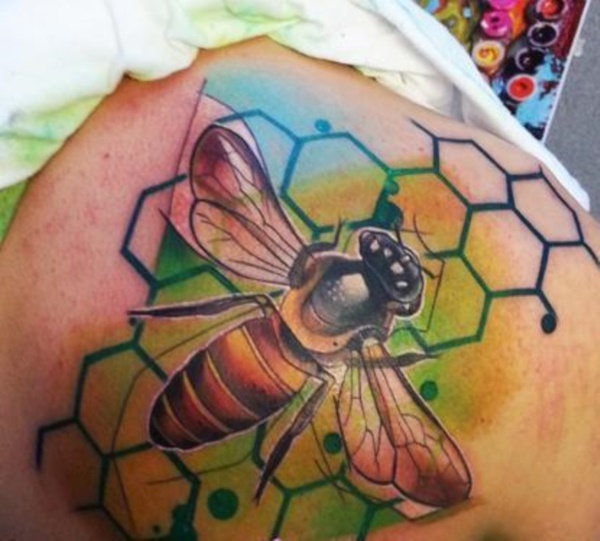 This bee and honey tattoo is animated and cute. The effects of the colors make it beautiful. 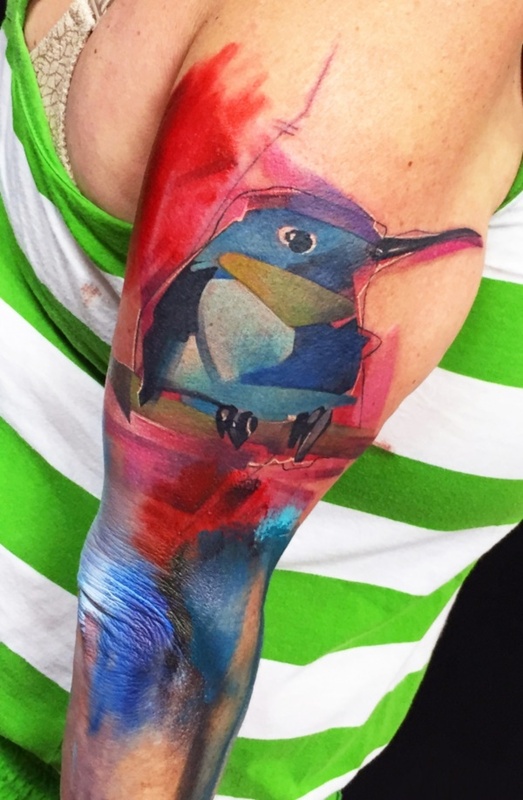 This animated bird tattoo is very creative and the blend of the colors is very unique. 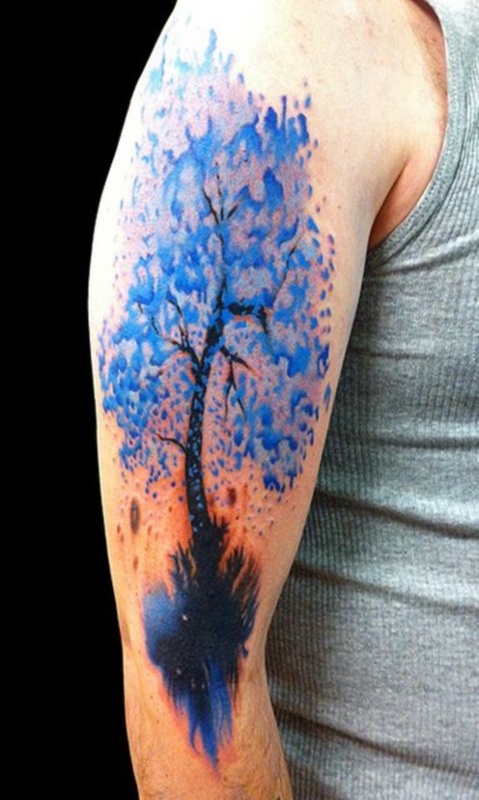 The edges and background colors are vibrant that makes the tattoo incredibly amazing. If you love the effects of pale and dull colors, you may opt with this design. 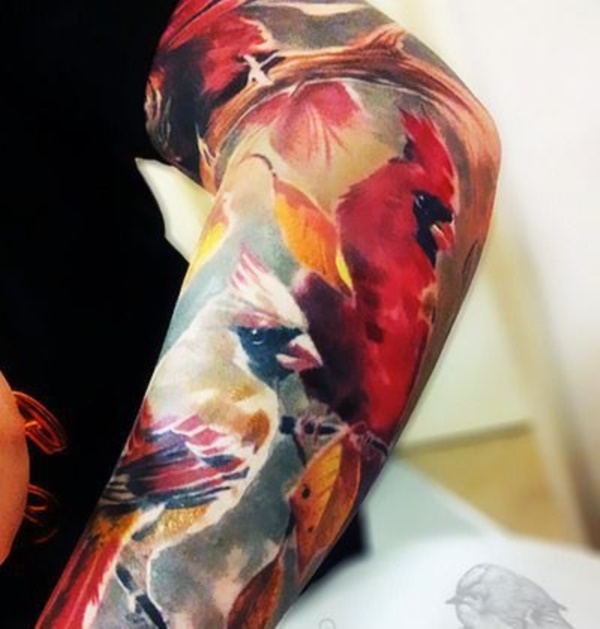 It’s like a semi-abstract bird painting and it is simple yet artistic. Do you love cats? 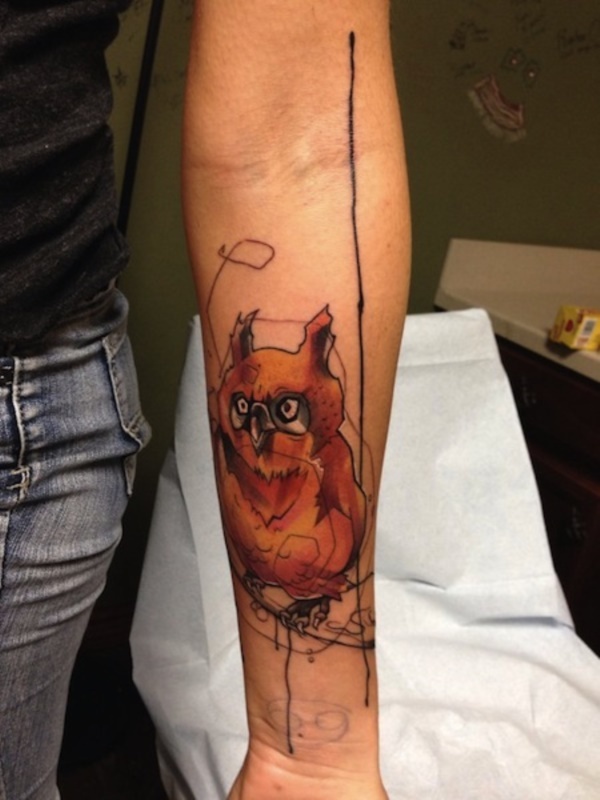 You may imprint your favorite cat on your shoulder by means of a tattoo art. 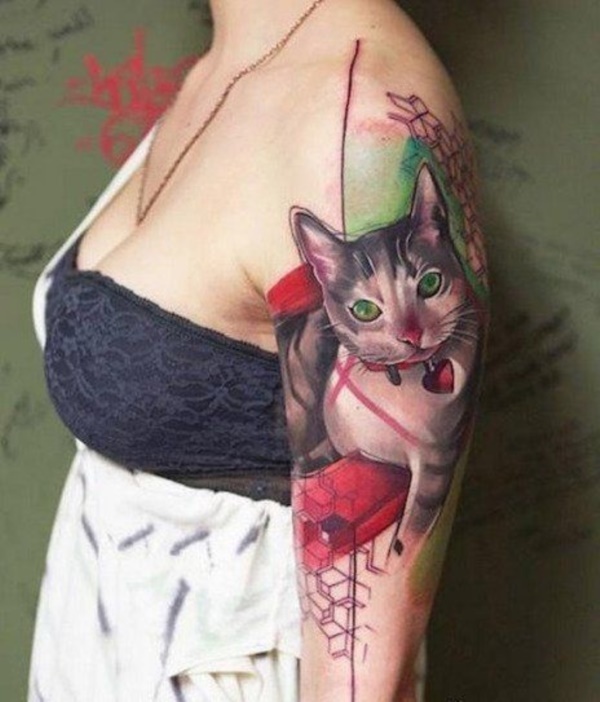 The technicality and artistry of the tattoo is awesome as if the cat is seducing you. 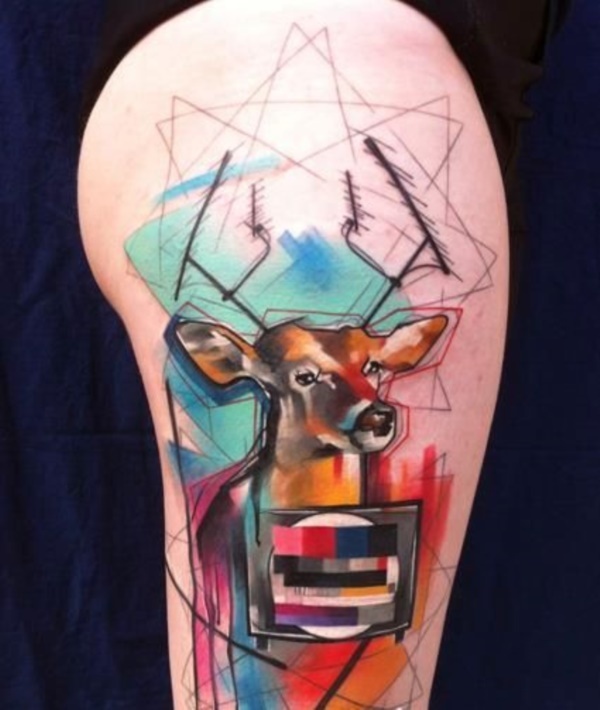 If you want a unique animal body art, you should try this reindeer paint in a modern touch. It is very creative due to the proper mixing of the colors. Do you love images that contain the picture of a woman? You may try this amazing girl with a poker face and it will surely draw a lot of attention. Many people do love cars. If you’re one of them, you should get your own inspirational car tattoo. The effects of the orange and violet complements to each other producing a beautiful result. Are you a fan of the elephants? 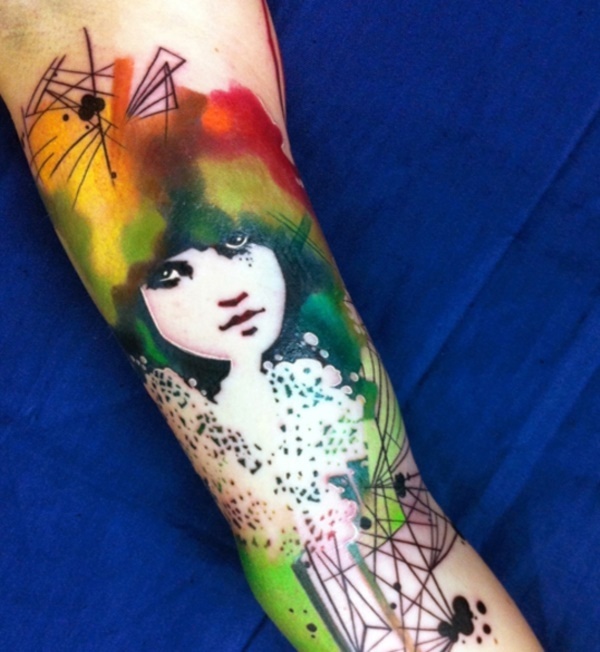 Try this awesome tattoo with the touch of the rainbow colors for a different style effects. Stay unique and popularize your own tattoo art. In this image, you can see the little girl feeding the hen and its chicks. It is not a typical tattoo but it connotes a meaning. 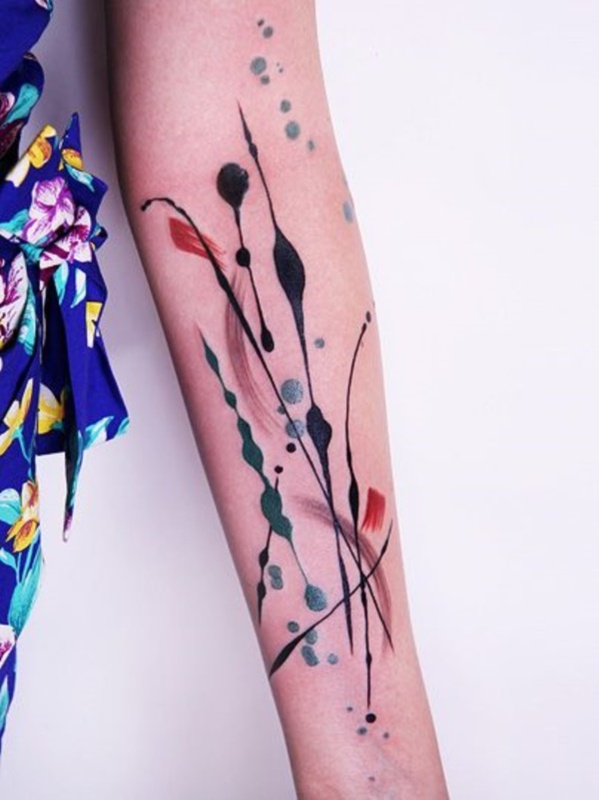 If you’re a type of person who loves semi-abstract paintings, you should have you tattoo art in an abstract inspired tattoo creation. 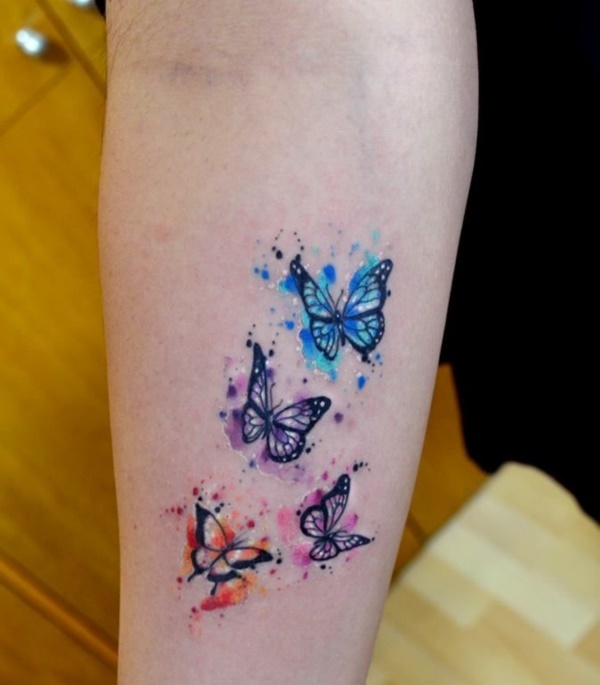 Feel like a fairy or a god of the nature by having butterflies tattoo art. 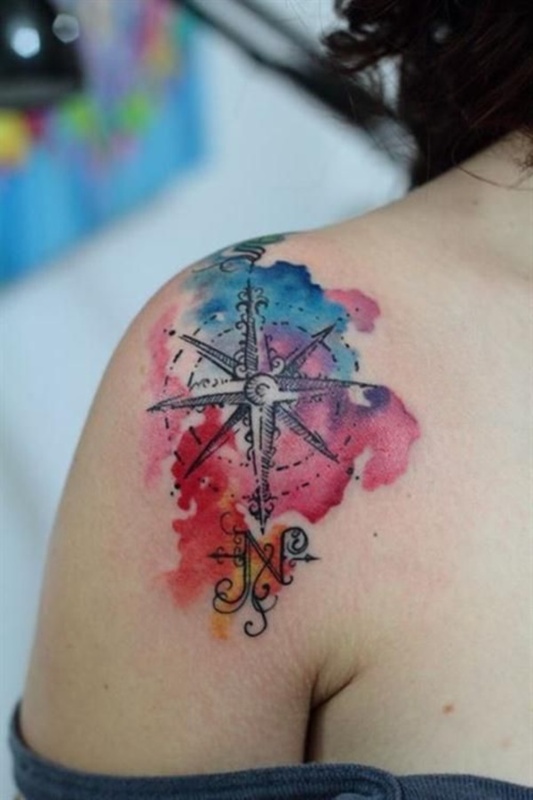 Even if its just a combination of four colors, the tattoo is simple yet beautiful. 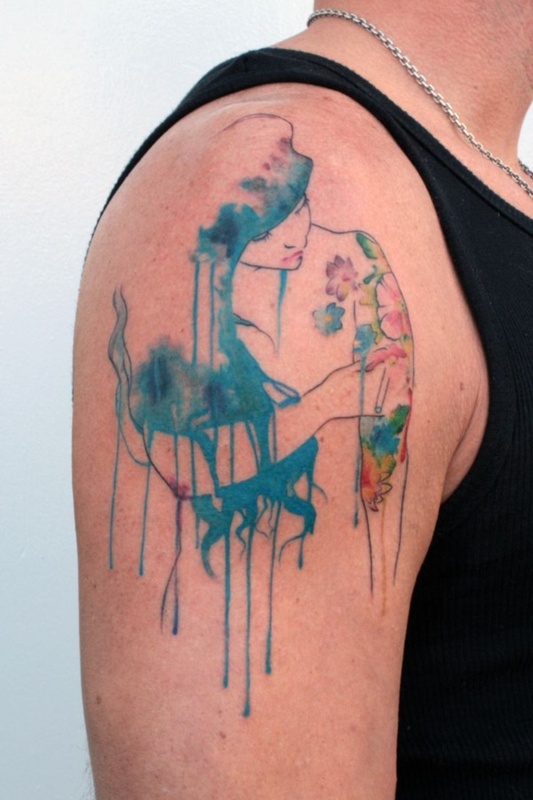 The tattoo figure here depicts a deep meaning and the style of the paint is totally a WOW. Its like a vandal style of tattoo. Do you love floral patterns? 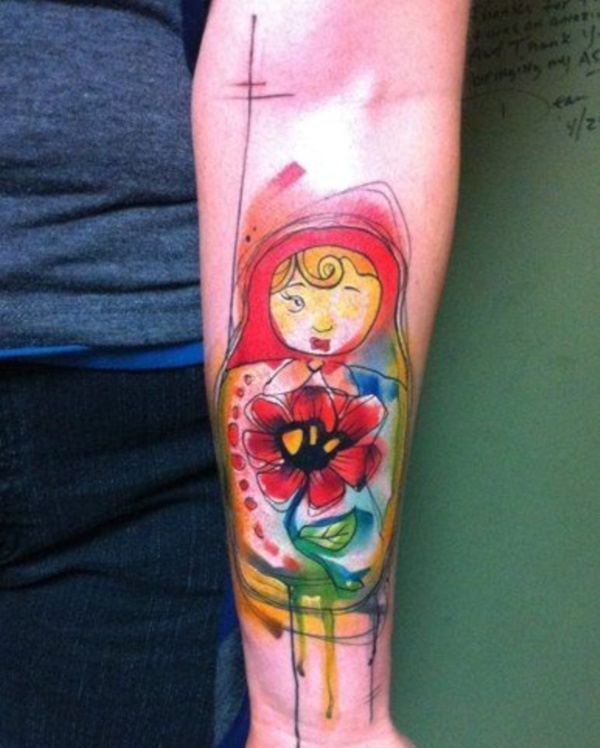 This tattoo design is surely a thumbsup for you. The combination of the colors and shades makes it really creative. 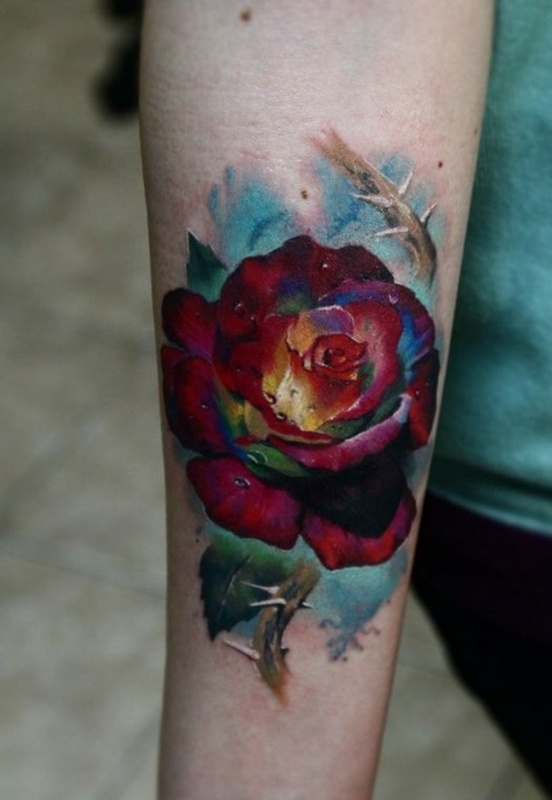 The rose depicts a 3D effect and it is emphasize in the arm through the skyblue background as if it is glowing. 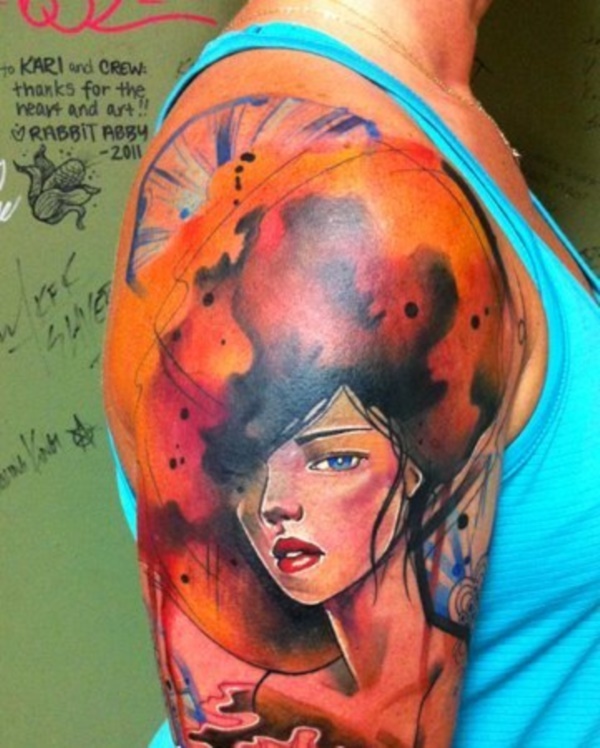 The artistic blend of colors and ideas in this tattoo makes it incredibly creative. 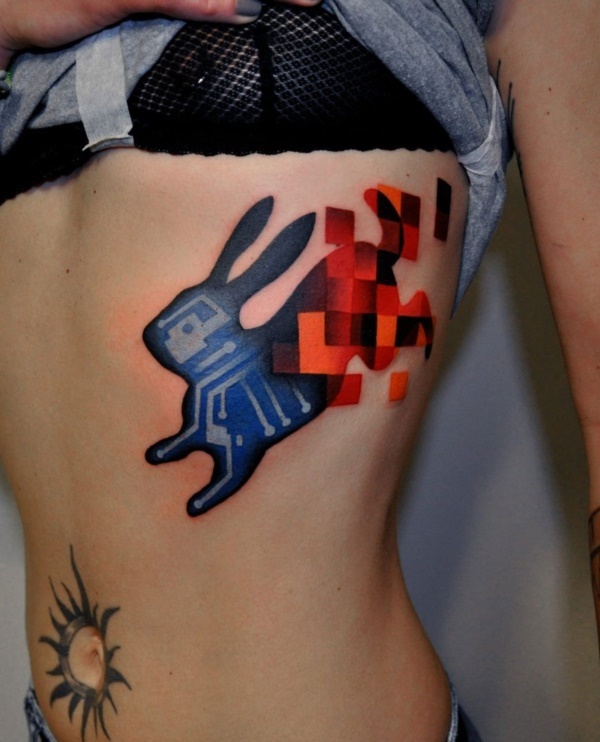 The tattoo is like a computerized design. 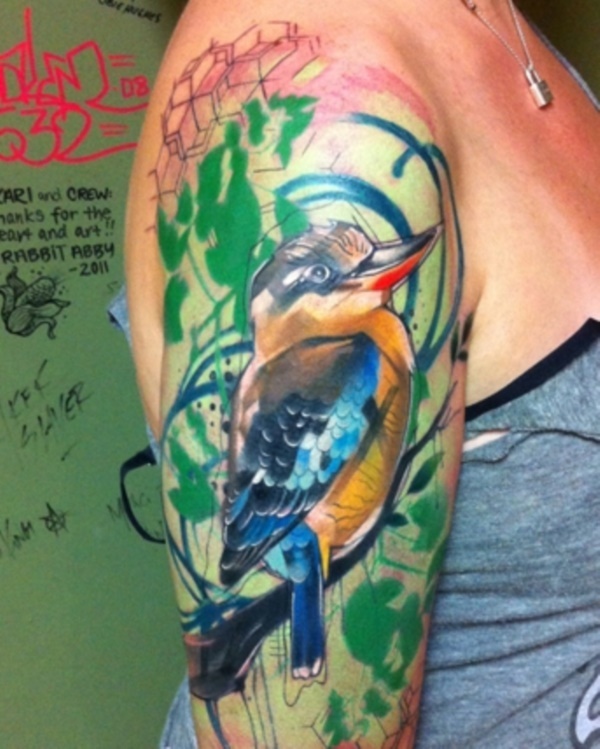 In this tattoo, the blue bird is amazingly imprinted on the body art as if it is a computerized design. The bird is simple yet cute. The use of the colors is like a blend of oil and paint. 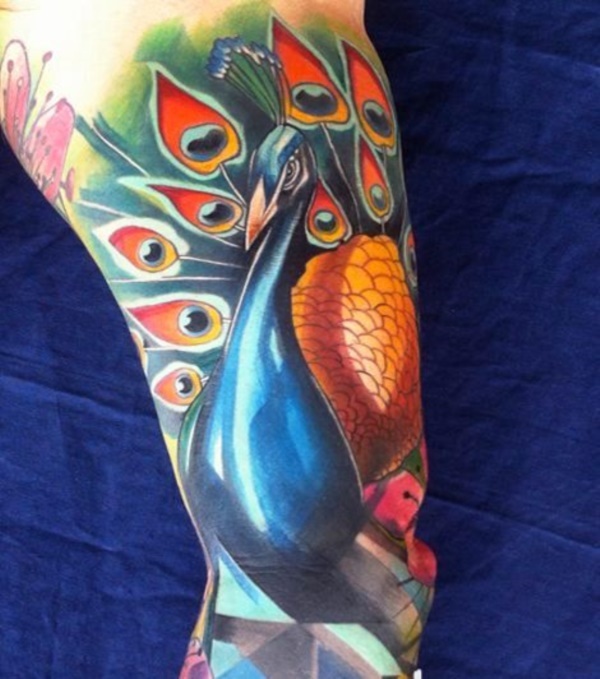 The idea and color mixing makes the tattoo a very awesome body paint art. 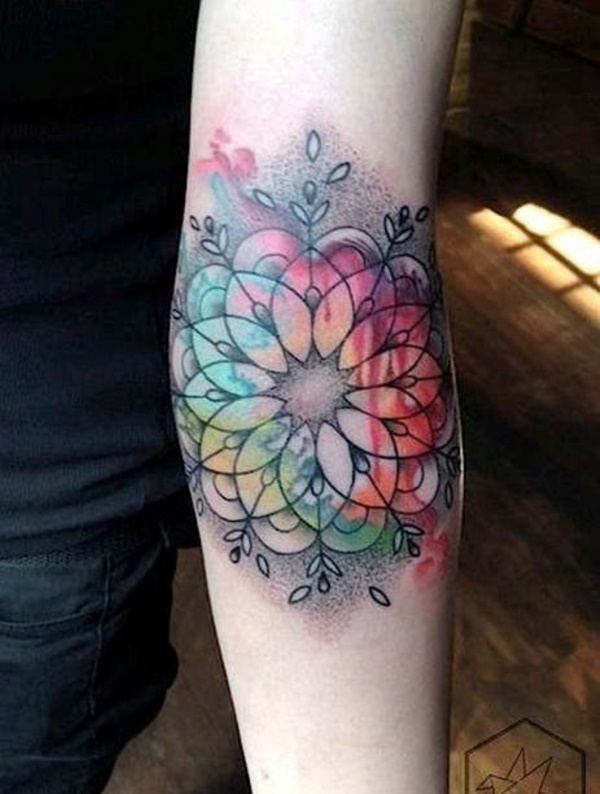 The design of this tattoo makes a moving effect to the figures as the flower overlaps with gear images filled with wondered colors. Wear the beauty of abstract art complimenting a feminine figure of beauty. 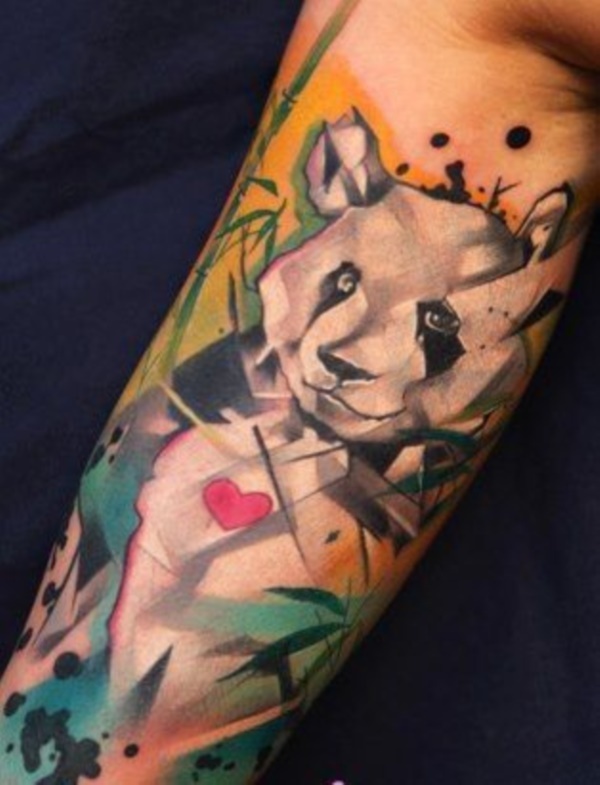 Be joyful like this tattoo of panda complimented with an abstract lines, angles and colors that makes it beautifully vibrant. This tattoo is one of a kind. A butterfly perfectly created with patterns that shows its wings and is complimented by the colors of blue, white and black. A beautiful asymmetrical line that reflects the directions of north, east, west and south, and is added with colorful backgroungd. 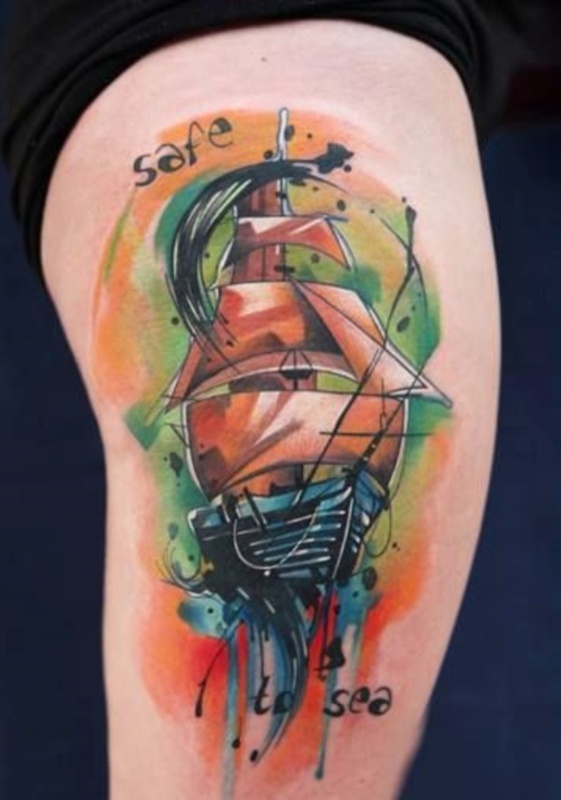 Colorful and beautifully patterned ship is the one to have. It’s patterns makes it have the character and the colors makes it as vibrant as it should. A tattoo of art that delivers a deep message. Its colors and the image itself are so artistic that it will give you the thrills of making your own interpretations. What could be more vibrant than this flowers shining bright with its lines and colors. 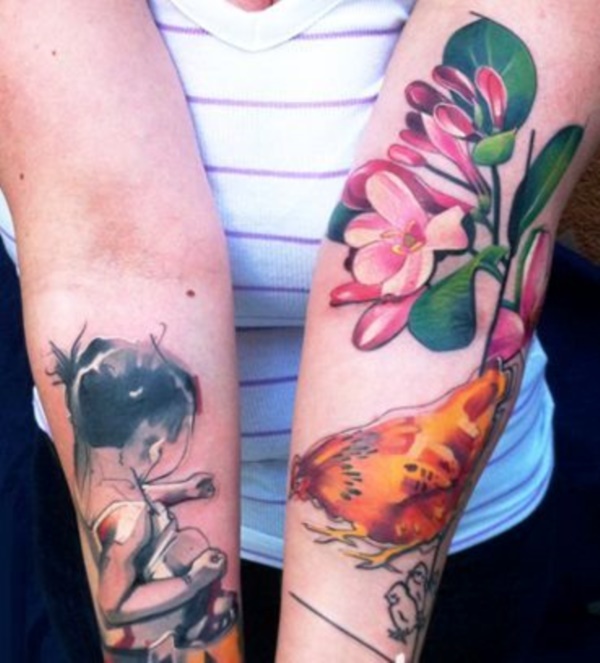 This tattoo is perfect for ladies. 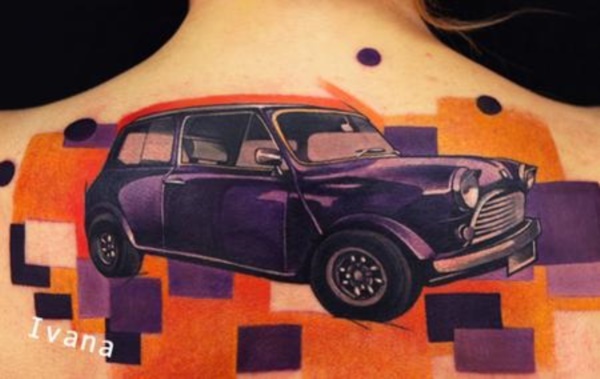 This cool tattoo delivers an urban lifestyle aura as it possess the lines, colors and character of the city side. 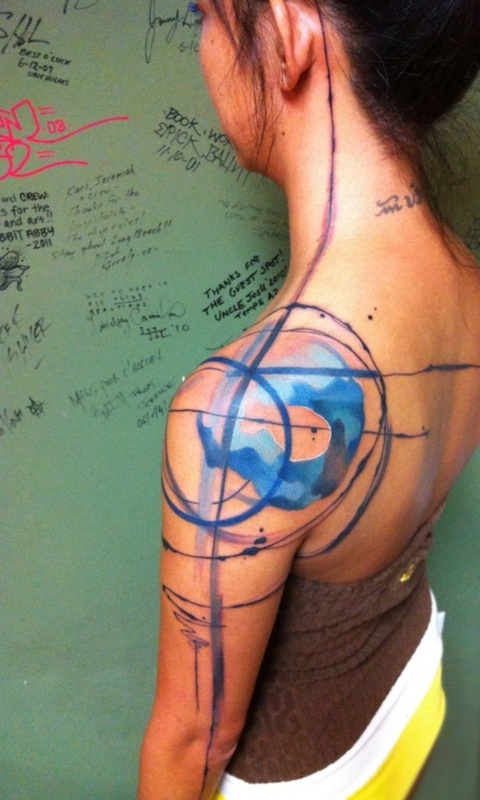 This is one attractive tattoo drawn with geometrical lines and shapes that goes around the body. 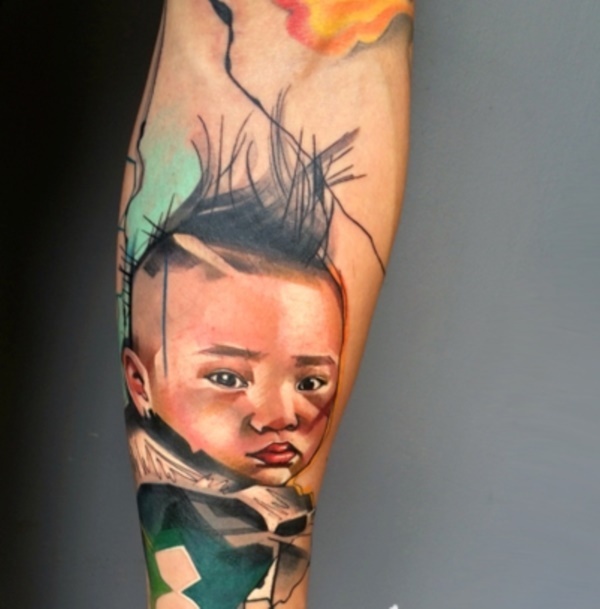 This is a tricky tattoo that is made with creativity of concept and colors using the image of the child that seems to be feeding the hen and her chicks. This tattoo is filled with emotions. The flowers and the face of the lady expresses an emotion that you will certainly feel. 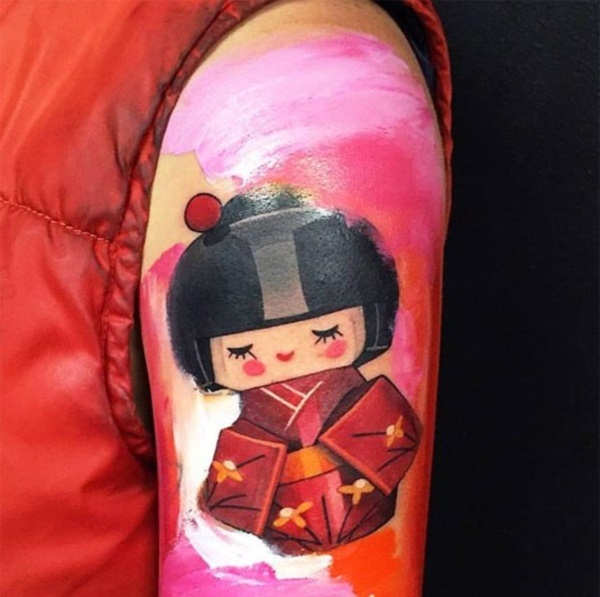 A cheeky and cute tattoo of a Japanese doll is the one to have. It is filled with beautiful lines and vibrant colors this doll is an attractive one. 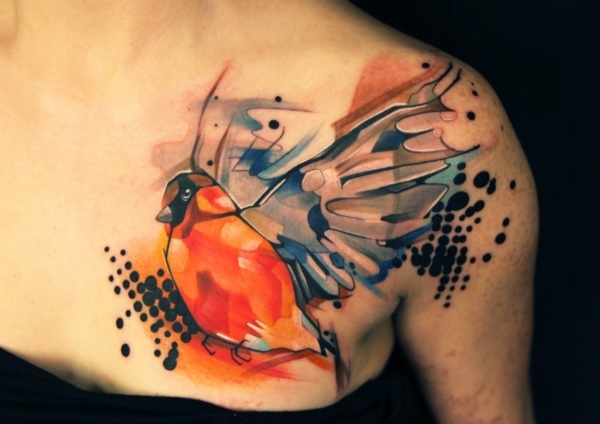 A tattoo that is expressed with great creativity from the abstract concept of a girl and a lovely bird. 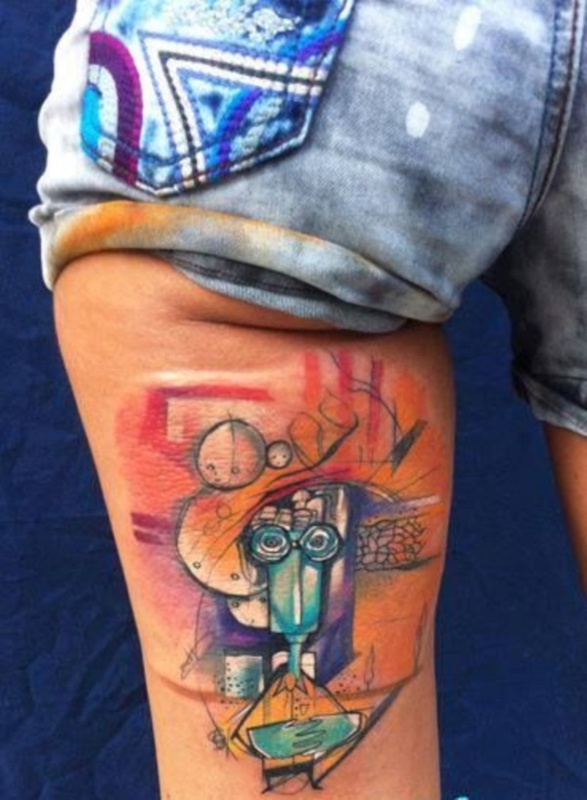 This is an interesting concept of a tattoo that is blending the idea of the future and past of Aztec designs. 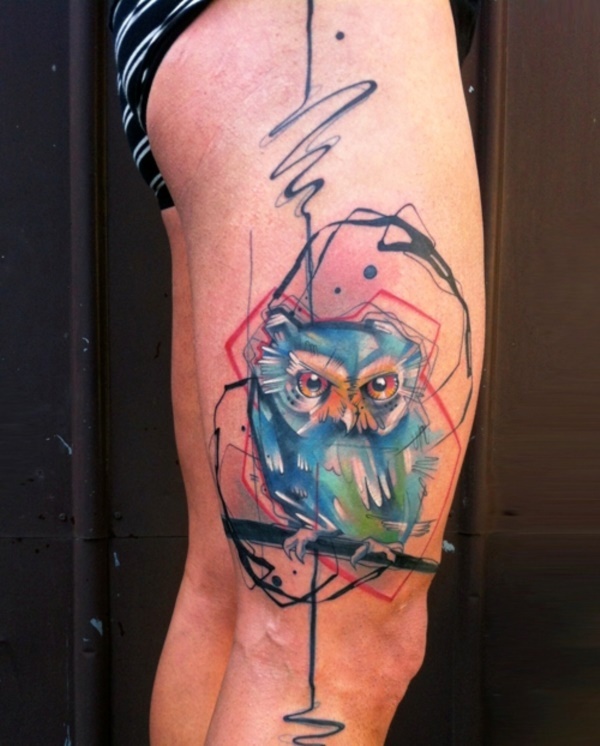 Designed with the right colors, this owl tattoo is definitely a must have, together with its creative lines. 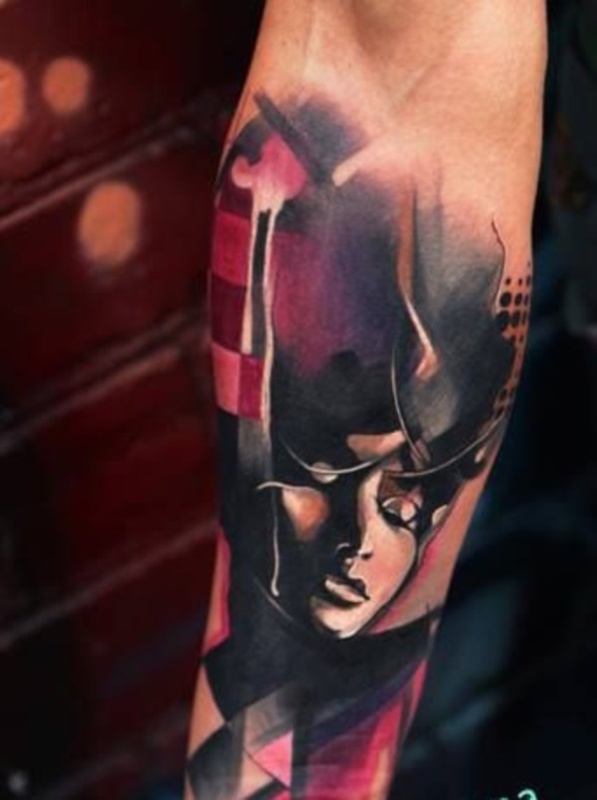 A glamorous and creative tattoo. 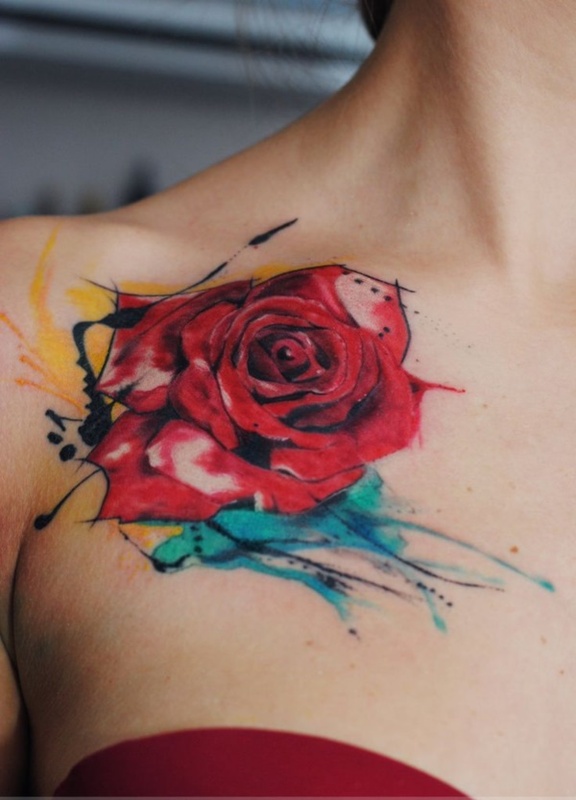 This tattoo with rose-like flowers blended with an outstanding color of red creates the stylish effect. 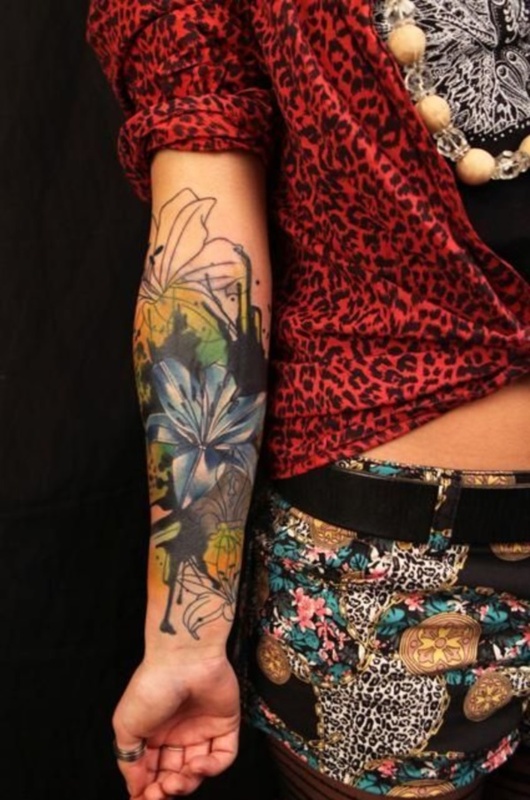 This tattoo is a must have because of its cool design. It’s patterns are created with beauty and balance and is complimented by the colors of red and black. Two images with similar subject but in different forms. The one created in abstract design, and the other one created with fine lines and realistic colors. 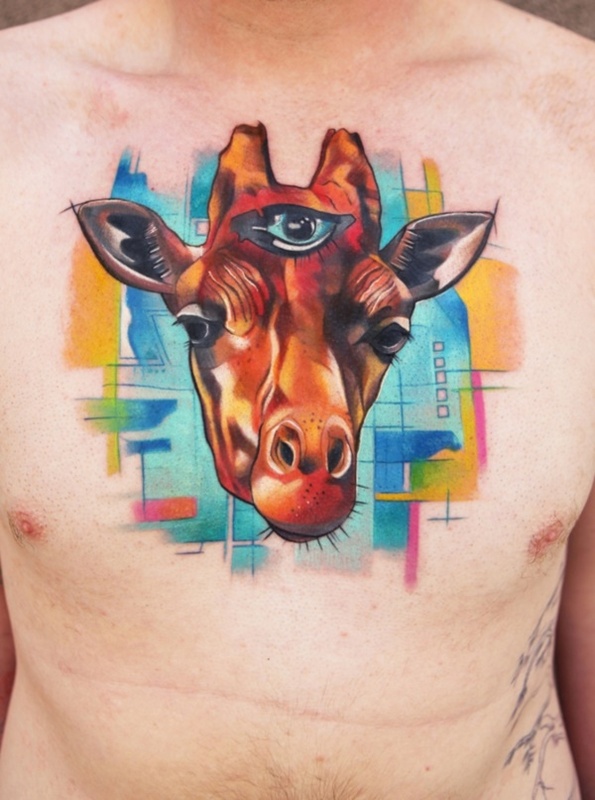 An art using the animal giraffe blended with a called third eye and floating on a background of colors. This is a simple concept but has fantastic output of abstract art in the wonderful colors comination of pink and black. 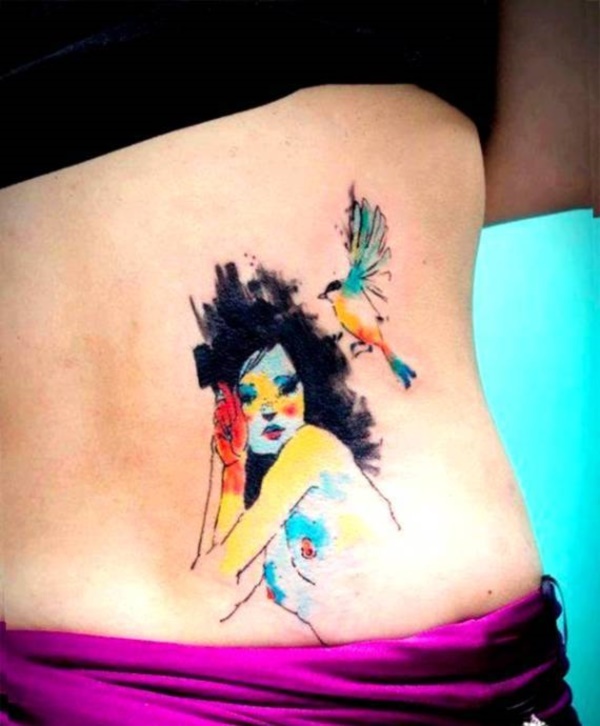 This is a cute and artistic tattoo design of a sparrow in vibrant colors of blue, yellow and red that is complimented by background colors of green. A perfectly designed contemporary art of an owl created with patterns and colors to make it realistic but still in vibrant colors. 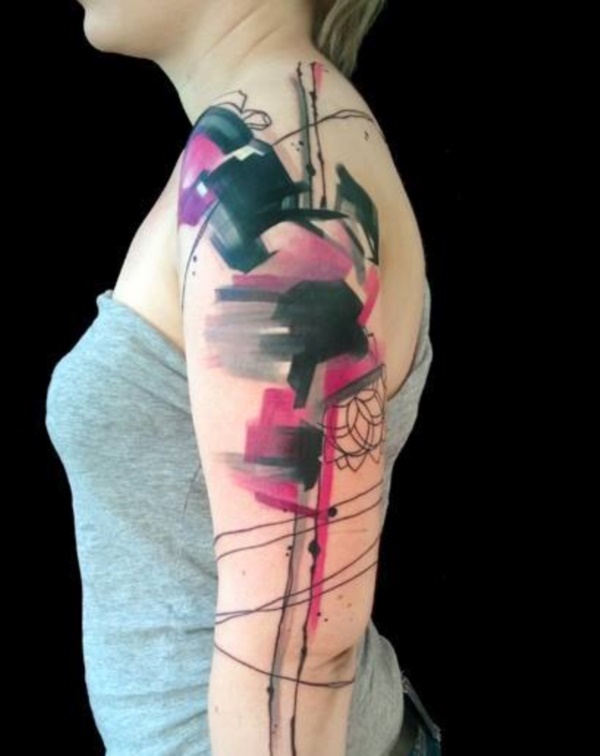 Geometry and abstract colors, this tattoo is all about that. 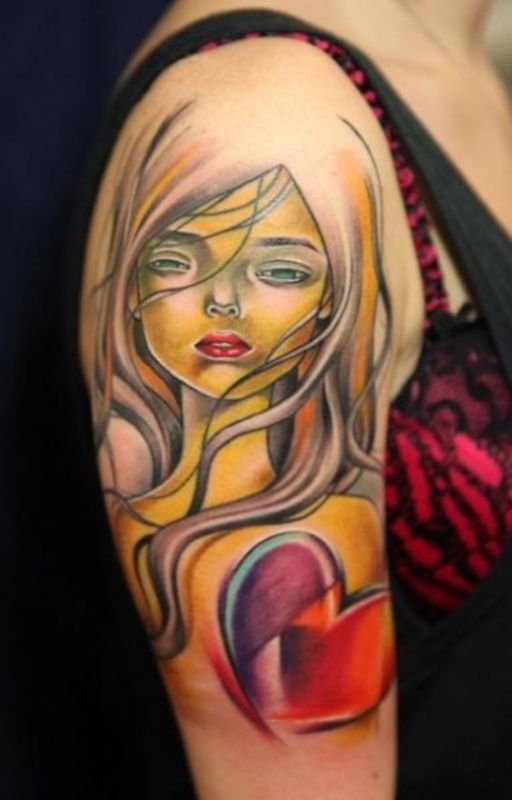 The colors and lines compliments a female face inside the tattoo. This female face is brought back to her roots by blending it with vivid colors that expresses vibrancy and nature. 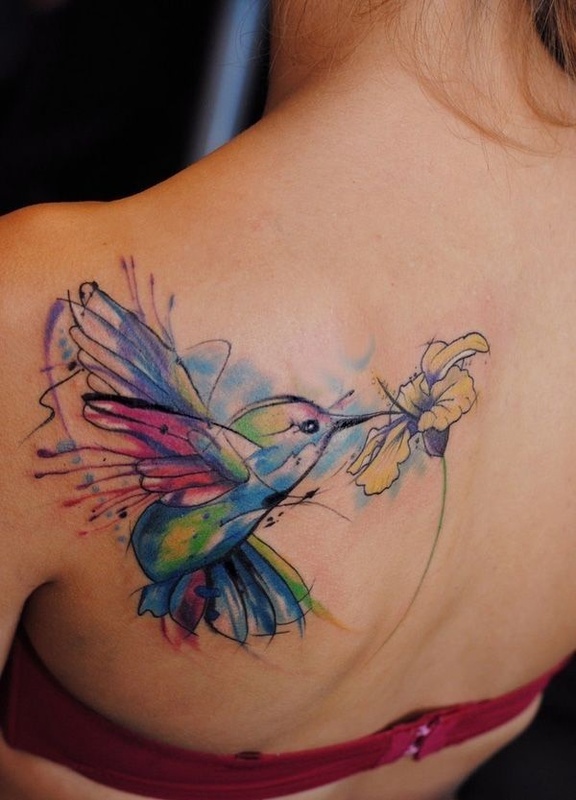 This is simple but still attractive tattoo drawn with minimal lines and colors but still vibrantly beautiful. 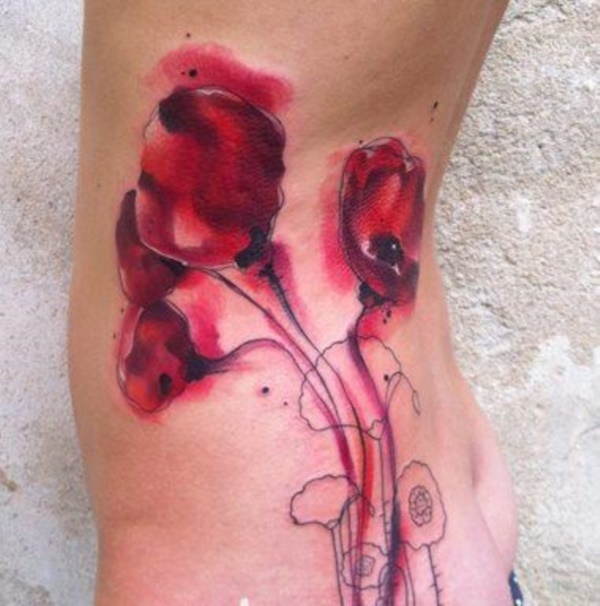 This tattoo is perfect for girls and guys because of its cool design. Two birds in perfectly matched colors standing on background of nature. An out of this world concept of mythical creature drawn in interesting lines and shapes and blended with vibrant background colors. The vibrancy and attractiveness if this photo roots from its concept of a bird dressed in rainbow-like colors and abstract lines around it. 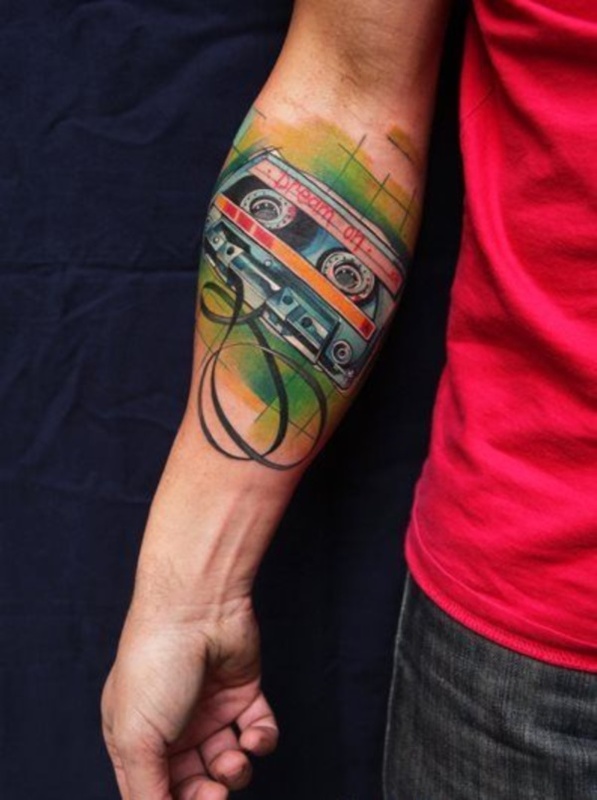 This tattoo symbolizes the beauty and love of music through its vintage tape recorders with urban concept of art. 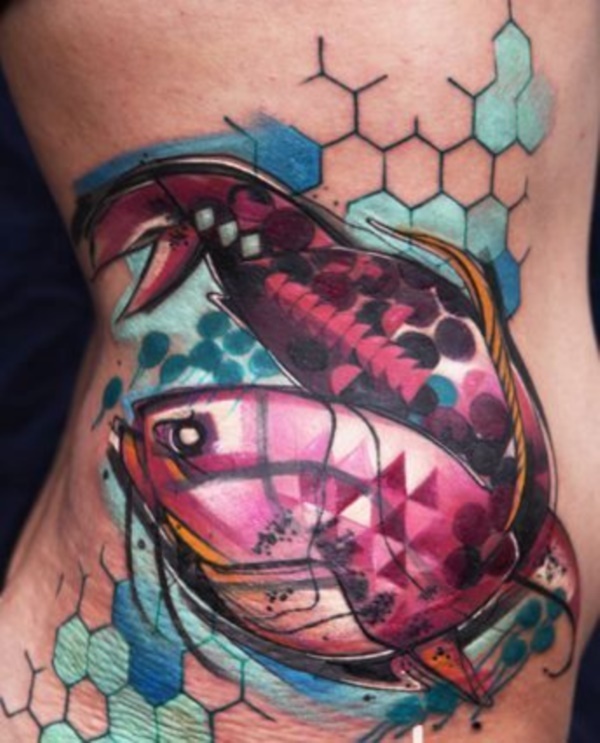 A fish brought to life in a way of tattoo and came out perfectly with beautiful colors and live patterns. 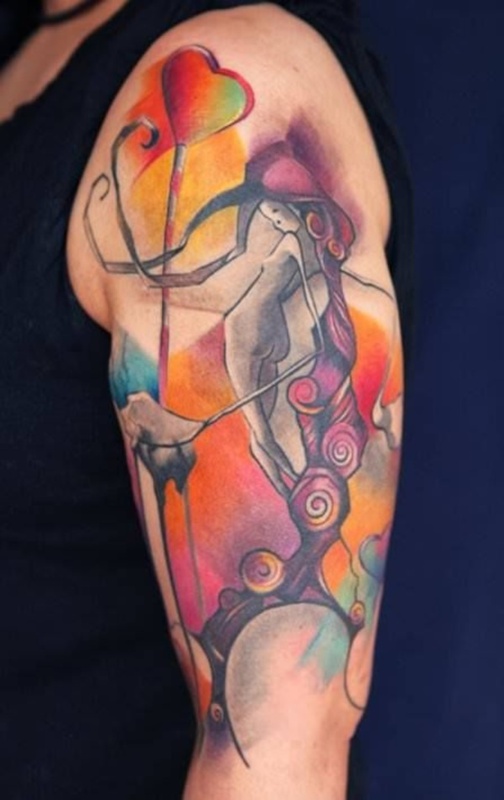 This interesting tattoo got some aura in it that will make you wonder and amazed with its color and structure like it comes out from an enchanted world. 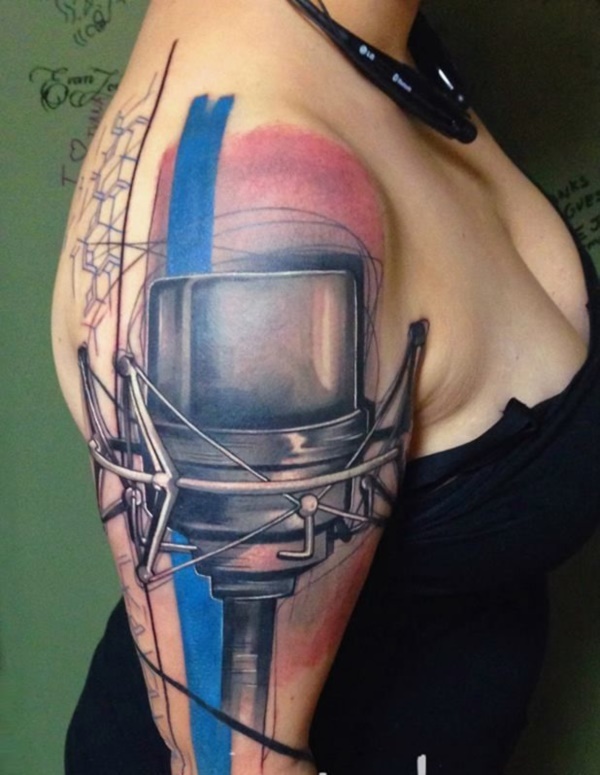 Lines, angles, and colors, this is what this tattoo is made of. 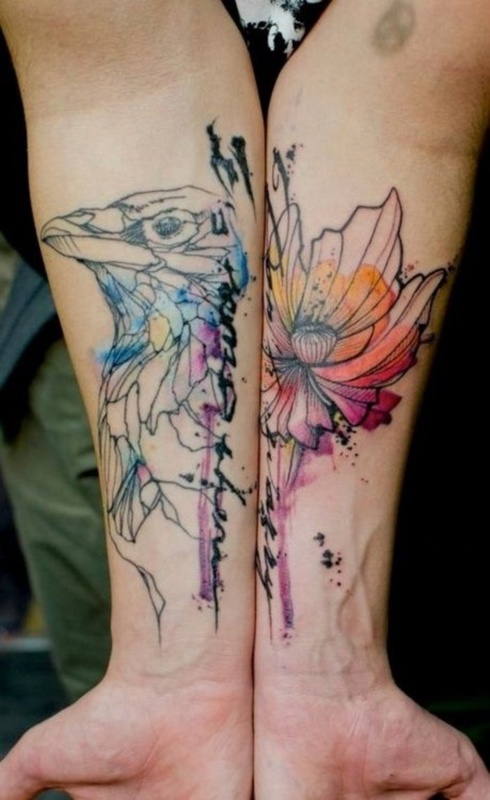 The bird and flower symbolizes the love of nature. 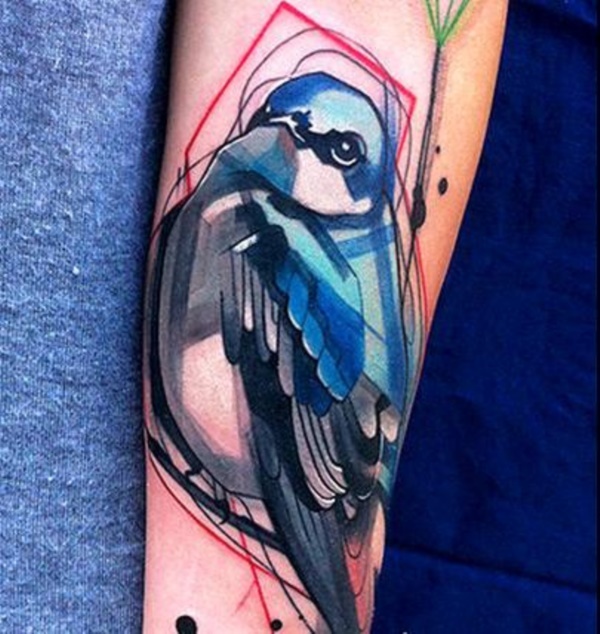 This tattoo is perfectly drawn in symmetry of lines, and is blended with beautiful colors. 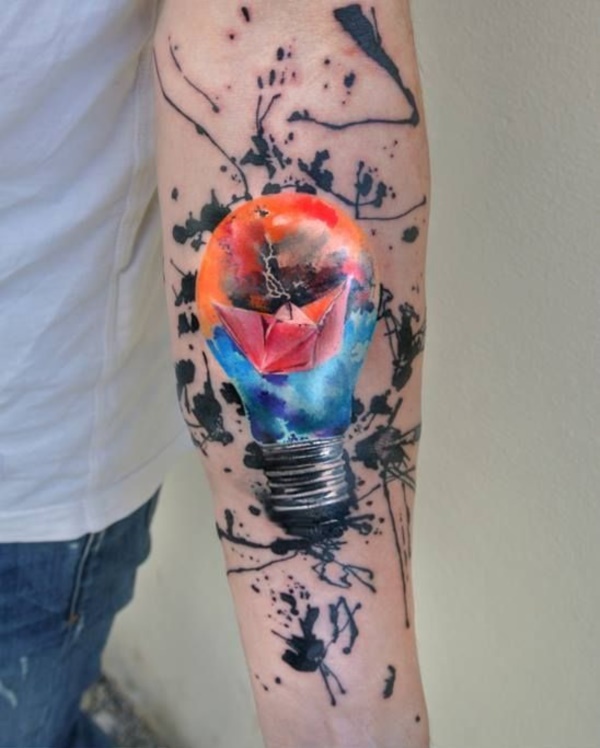 A tattoo with realistic design using the colors to make it float like a real life bulb and is also filled with vibrant colors of orange and blue with black background art. 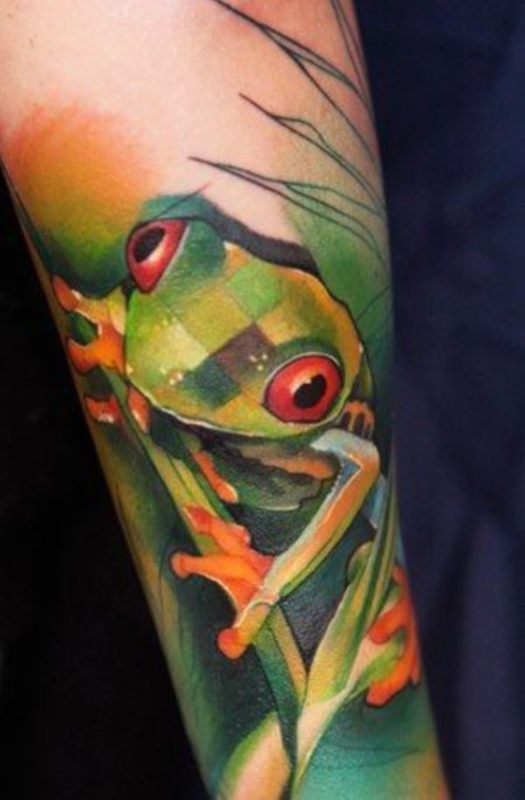 This frog tattoo is the real deal. It is drawn in nature loving colors just like a frog’s natural environment. 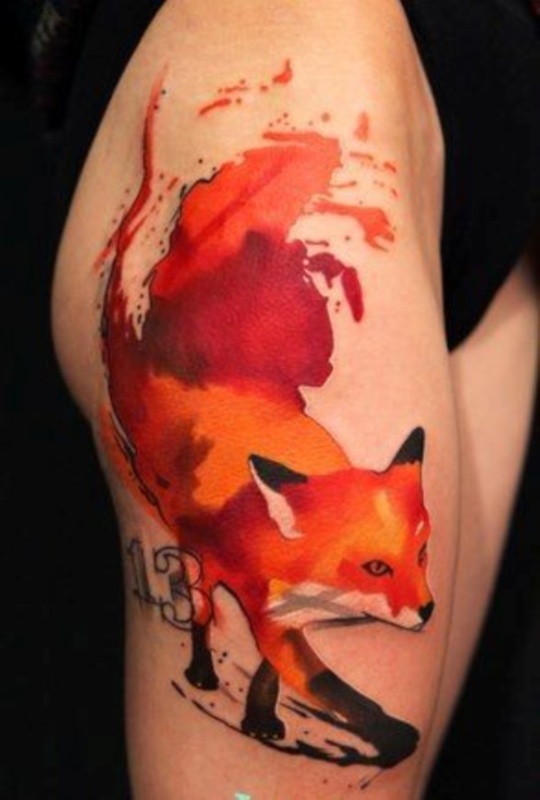 Wear the astonishing colors of this brave fox. 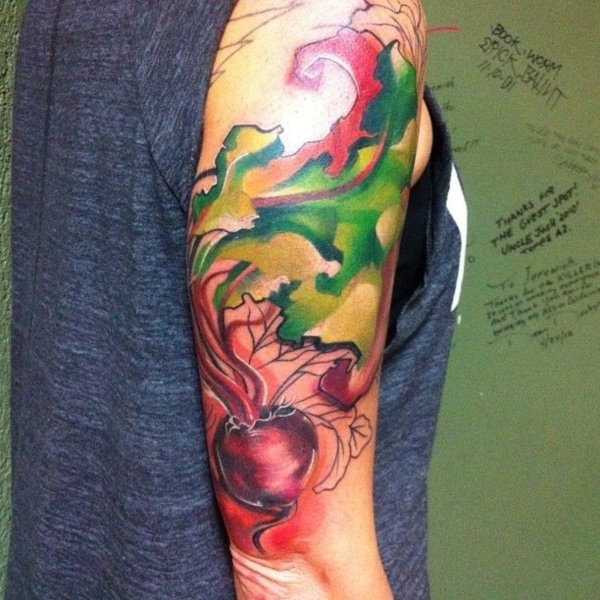 This tattoo is filled with colors of flames to produce an impact to the ones looking at it. 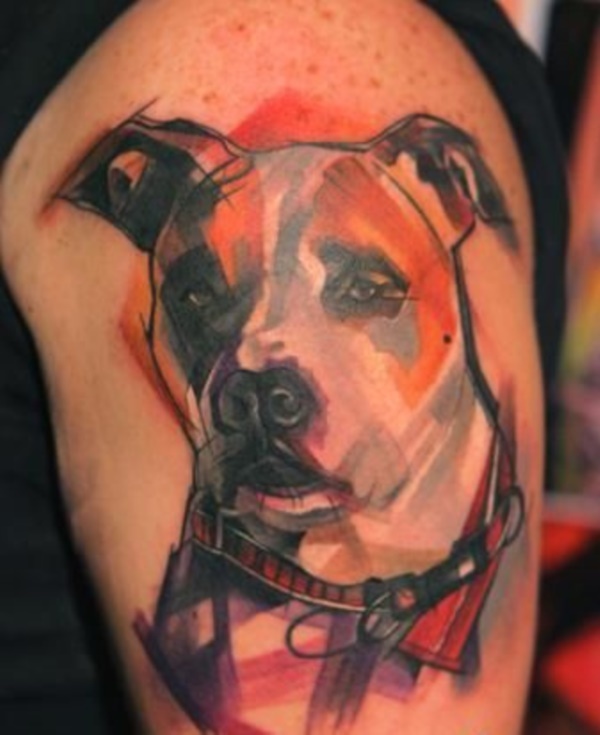 This one is a pet inspired tattoo and is drawn with abstract lines and strokes. This interesting owl design is a head turner. 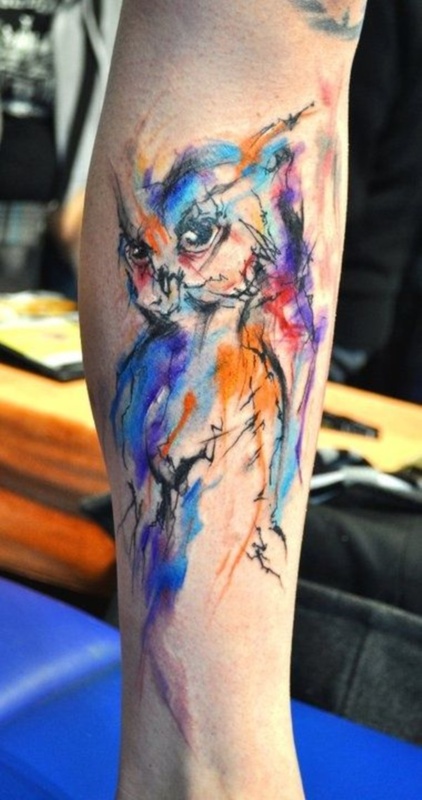 It has a series of overlapping abstract lines that created this image of an owl. 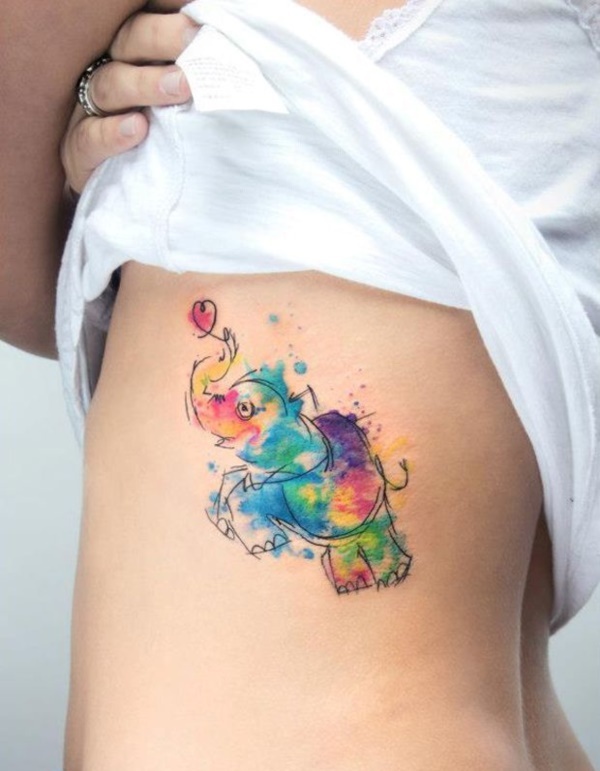 You can call this tattoo as simply artistic because of its minimal details of lines and colors, but is still attractive in its own ways. This one is for the geek ones. This creative and smart looking figure is one of a kind because of its colors and shapes around it. 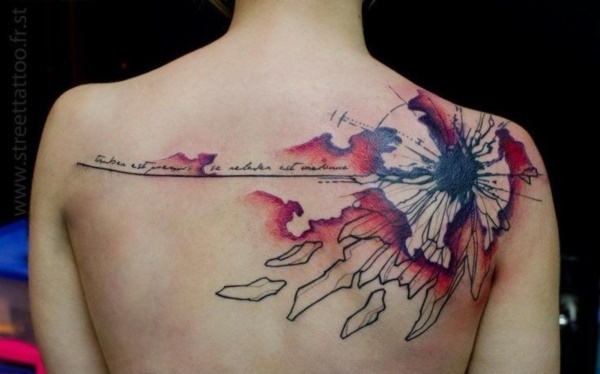 This is a beautiful tattoo in a beautiful concept. This image of a bird picking up in the flower is a wonderful sight because of its abstract lines and colors. 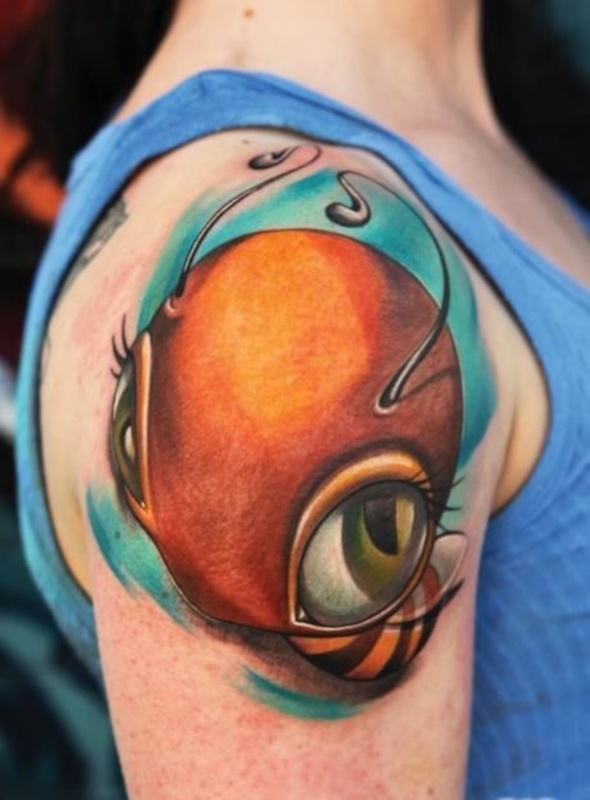 A cute and creative tattoo of a bee with a mind bending illusion of its bubble head painted with its natural colors. 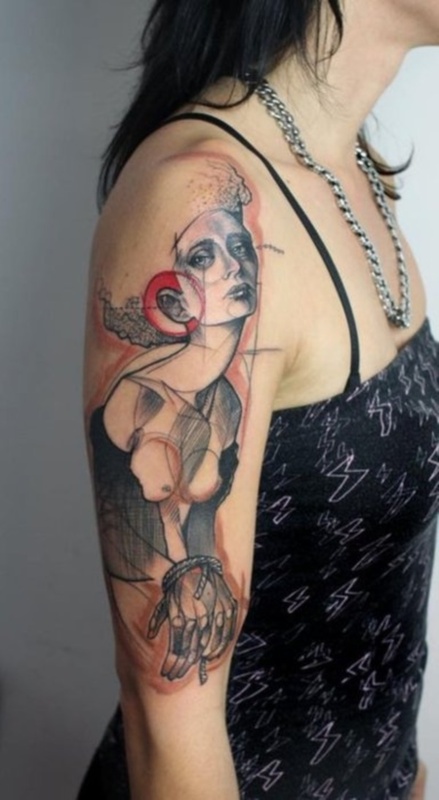 This tattoo is a combination of realistic image and the abstract form of art. 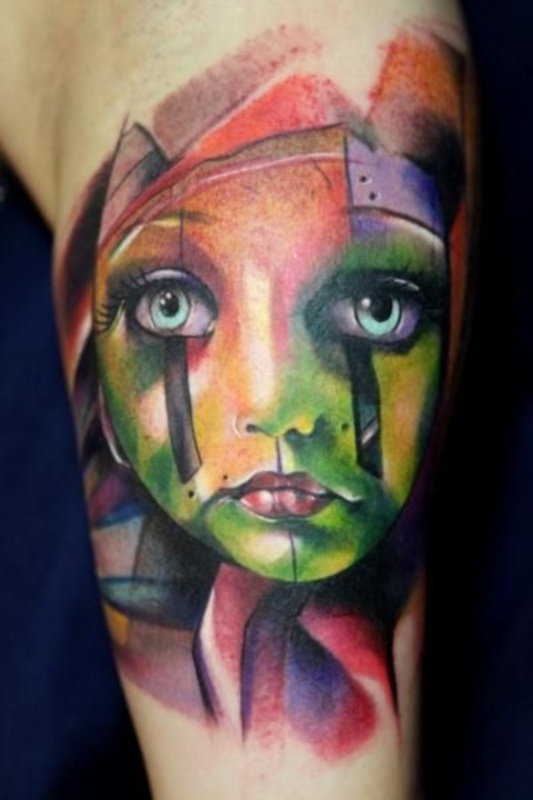 A female face in dark colors and is surrounded by abstract shapes and colors. 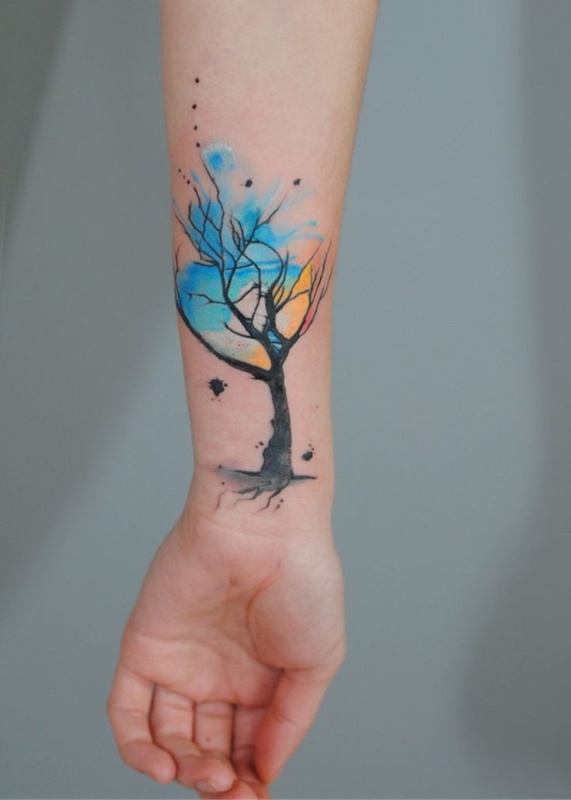 What a simple yet colorful way to express art in your wrist I this simple drawn but vibrant colors of a tree. 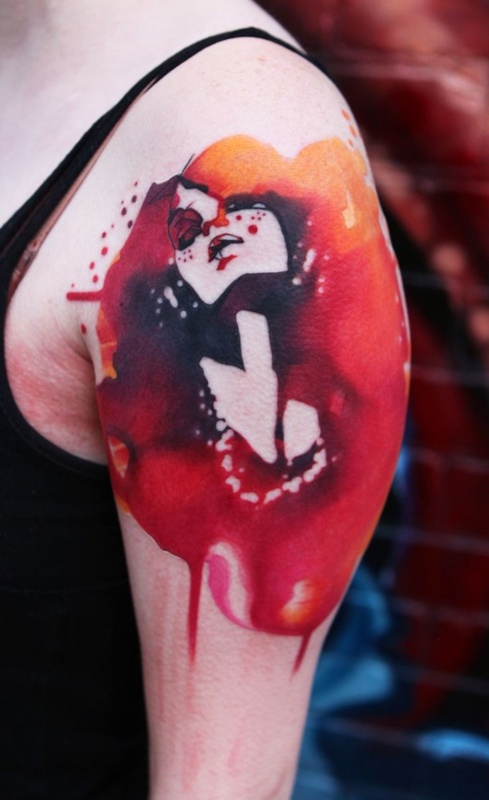 A tattoo oozing with emotions of a female face surrounded by fire-like background. This tattoo is a mechanical inspired with its lines and structures of iron and makes a masculine effect to the look. 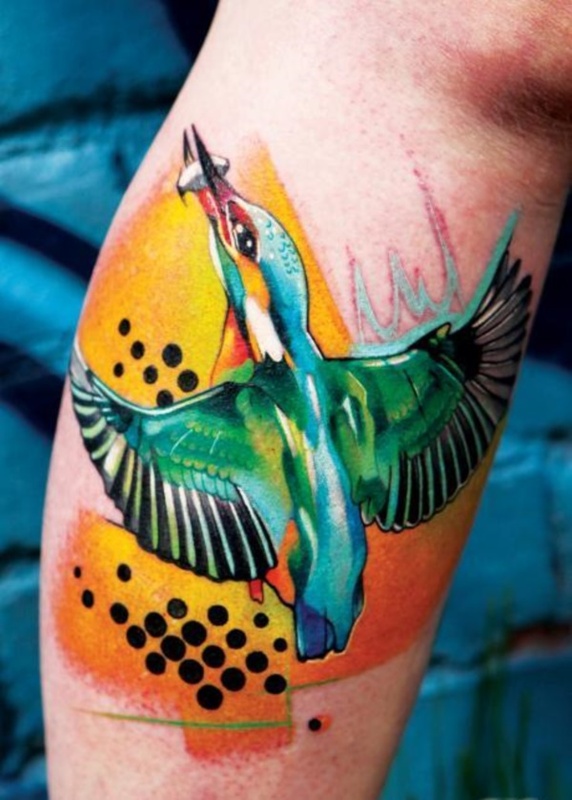 A one of a kind tattoo image of a colorful bird having its food in its mouth. 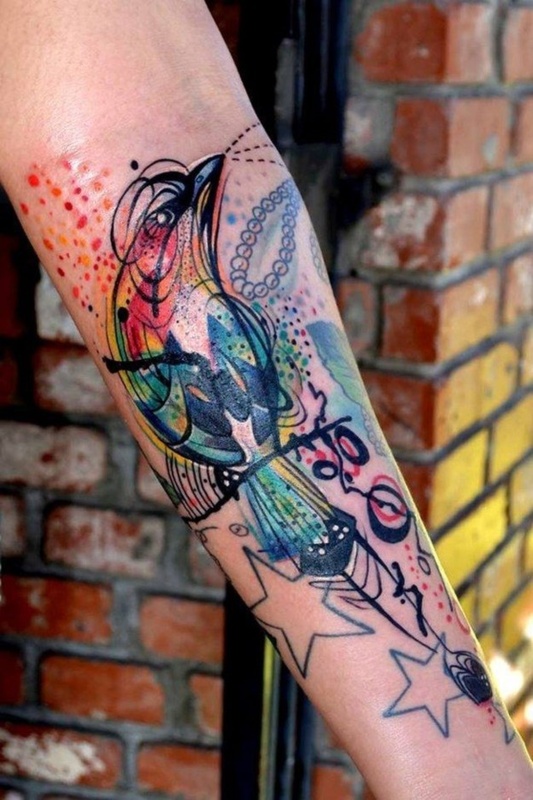 This tattoo is filled with colors and lines that highlights body and feather. 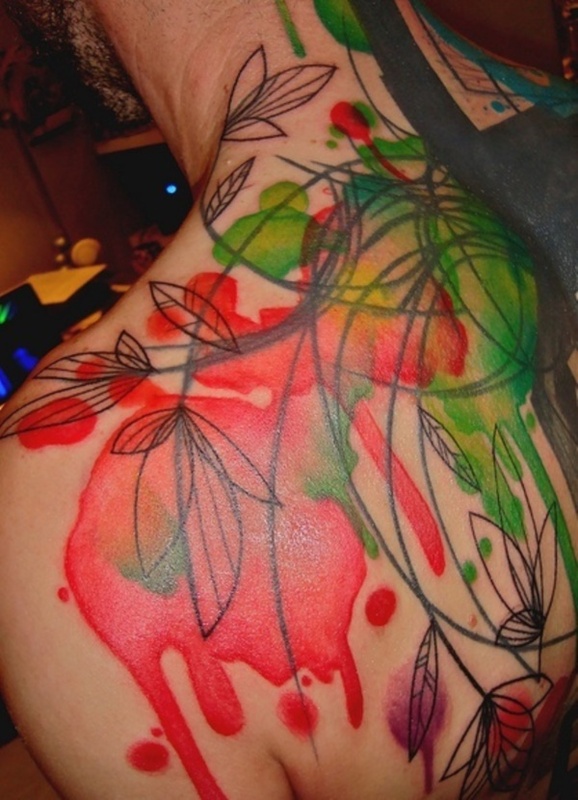 What a colorful sight of a tattoo that is filled with lines and curves only to compliment the nature-like concept of it. 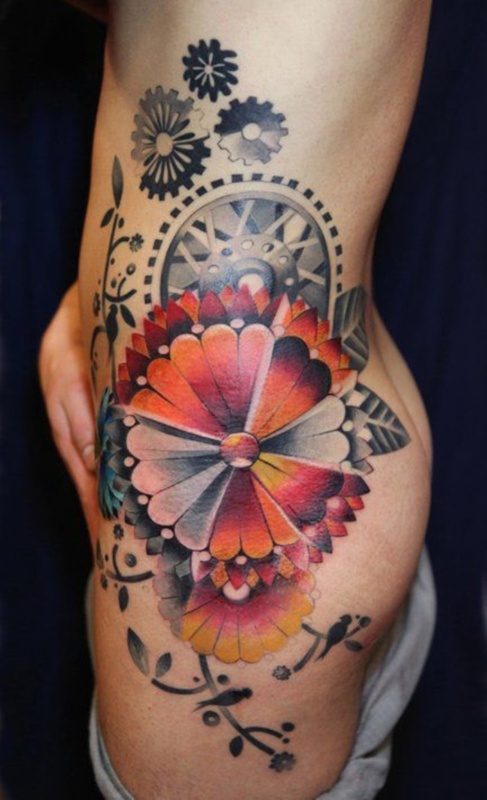 This is one attractive flower drawn in fine lines and colors to emphasize the leaves and its beautiful petals.